First, the snow melts and the days are longer and brighter. Birds that have been quiet for months start to use their voices. You may hear a song in passing and remember that meadowlarks occupy the sagebrush and grasslands along the edge of the forest. 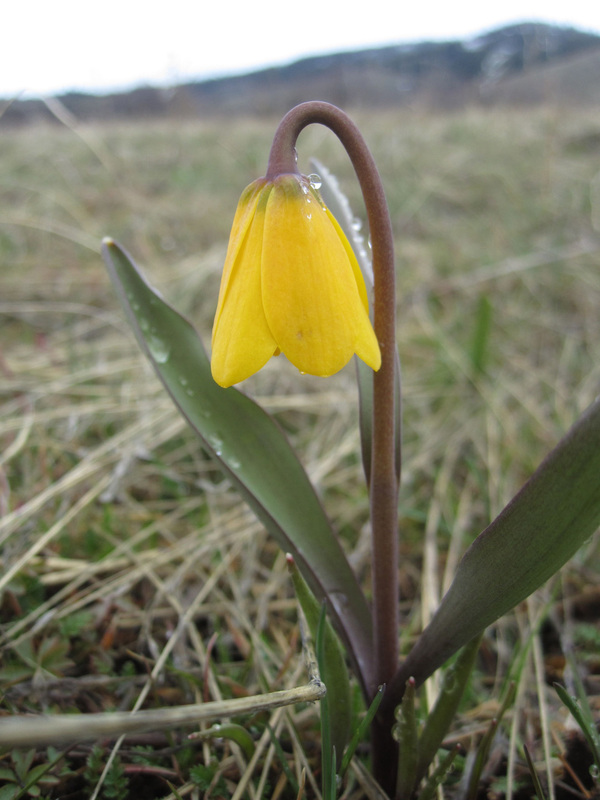 If you slow to examine the dots of yellow, you will find the fritillaries nodding their heads where they come up between elk tracks in the saturated soil. Violet-gray clouds tower over the valley where mountains push them up, and in the afternoon they may let loose a rush of wind and hail. Or snow. Or rain. You may even hear a grumble of thunder. We talk about a spring break as if there is a pause between winter and spring. In an academic year, the end of March or first of April is the time to finish one term and take a break before starting another. As a student (and later a teacher) I remember anticipating this even more than a Christmas break. Give me a week to breathe before I have to dive into the next phase. But spring itself does not take a break. It advances relentlessly, slowing a little when the weather reverts to cold. But each day there are changes and any pauses are the ones you create for yourself. Spring is such a loaded time for me. I am dreaming of the trail. Looking over maps and looking for signs that the snow level has risen and pack receded. So looking forward to getting out there.